The meeting wasn't on the prime minister's public itinerary, but his office did tweet about it while it was underway early Thursday. Prime Minister Justin Trudeau met with General Motors CEO Mary Barra in Markham, Ont., on Thursday to discuss job creation, but neither the government nor automaker released many details about the discussions. 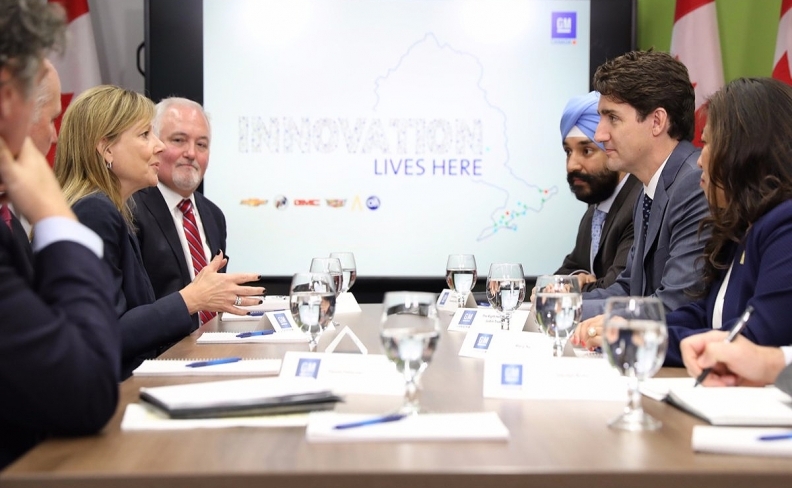 General Motors Canada CEO Stephen Carlisle and Navdeep Bains, Canada’s minister of innovation, science and economic development, were also in attendance. The meeting wasn’t on the prime minister’s public itinerary, but his office did tweet about it while it was underway early Thursday. “Started the day in Markham meeting with @GM's CEO @mtbarra, to talk about creating more jobs in Canada & empowering women in business,” read a post on the prime minister official Twitter page. Trudeau has made it clear that gender equity is a major plank of his government’s policies -- his first 31-member cabinet included 15 women -- and Barra is the first female CEO of a major global automaker. Officials from Trudeau’s office didn’t add much detail about the meeting in a statement issued to Automotive News Canada late Thursday evening. The automaker is in the process of hiring 1,000 software engineers over the next five years in Ontario. Most of them will work on technology used in autonomous and connected cars. GM has a technical center in Markham, where 700 people will eventually be employed. It’s no secret that GM and the Canadian government talk a lot. According to the Office of the Commissioner of Lobbying Canada’s online database, officials from or representatives of General Motors Canada have met to lobby the government on a variety issues 148 times since the Oct. 19, 2015 election that sent the Liberals to a majority government. That’s more meetings than any other automaker currently assembling vehicles in Canada. Ford Canada follows closely with 124 meetings.